Abstract. Marine ecosystems are increasingly stressed by human-induced changes. 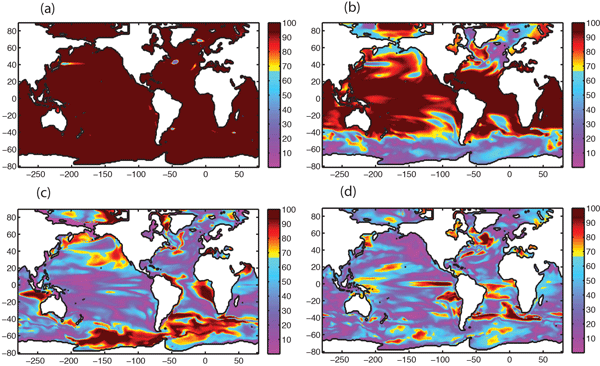 Marine ecosystem drivers that contribute to stressing ecosystems – including warming, acidification, deoxygenation and perturbations to biological productivity – can co-occur in space and time, but detecting their trends is complicated by the presence of noise associated with natural variability in the climate system. Here we use large initial-condition ensemble simulations with an Earth system model under a historical/RCP8.5 (representative concentration pathway 8.5) scenario over 1950–2100 to consider emergence characteristics for the four individual and combined drivers. Using a 1-standard-deviation (67% confidence) threshold of signal to noise to define emergence with a 30-year trend window, we show that ocean acidification emerges much earlier than other drivers, namely during the 20th century over most of the global ocean. For biological productivity, the anthropogenic signal does not emerge from the noise over most of the global ocean before the end of the 21st century. The early emergence pattern for sea surface temperature in low latitudes is reversed from that of subsurface oxygen inventories, where emergence occurs earlier in the Southern Ocean. For the combined multiple-driver field, 41% of the global ocean exhibits emergence for the 2005–2014 period, and 63% for the 2075–2084 period. The combined multiple-driver field reveals emergence patterns by the end of this century that are relatively high over much of the Southern Ocean, North Pacific, and Atlantic, but relatively low over the tropics and the South Pacific. For the case of two drivers, the tropics including habitats of coral reefs emerges earliest, with this driven by the joint effects of acidification and warming. It is precisely in the regions with pronounced emergence characteristics where marine ecosystems may be expected to be pushed outside of their comfort zone determined by the degree of natural background variability to which they are adapted. The results underscore the importance of sustained multi-decadal observing systems for monitoring multiple ecosystems drivers. 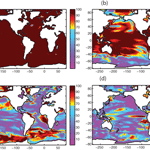 How to cite: Rodgers, K. B., Lin, J., and Frölicher, T. L.: Emergence of multiple ocean ecosystem drivers in a large ensemble suite with an Earth system model, Biogeosciences, 12, 3301-3320, https://doi.org/10.5194/bg-12-3301-2015, 2015.